536 pages | 33 B/W Illus. The key to marketing is understanding and satisfying consumer needs, thus a knowledge of consumer behavior is essential to any organization dealing with customers, users, or clients. This book promises to be a contemporary classic. It brings together an international set of scholars, many of whom are "household names", to examine the diverse approaches to consumer behavior topics. The editors employ a micro to macro structure, dividing each topic into three parts: one reflecting foundational work, one focused on emerging trends, and one covering practical applications. Each part examines the relationship between consumer behaviour and motivation, including well-being, gender, social class, and more, and concludes with practitioner perspectives on the challenges and opportunities that come with understanding customers. Readers will gain insight into how drives that are constantly in flux relate to other aspects of human cognition and behavior, allowing them to reach customers successfully, and to meet their needs. With contributions from leading scholars, including Sidney Levy and Jagdish Sheth, this volume sets the standard as the most comprehensive, cutting-edge resource on the subject of consumer behavior. Students of consumer behaviour and marketing will find this a useful exploration of a fast-moving field, fundamental to the welfare of companies, government, non-profits, and consumers. It will also benefit new and established academic researchers as well as practitioners who want to stay on top of current knowledge. "Featuring leading scholars in the field, this book surveys the breadth of consumer behavior research while providing sufficient depth for readers to appreciate both the existing knowledge and knowledge gaps in the domains it covers. It is a must-have reference for anyone wishing to perform research in consumer behavior." 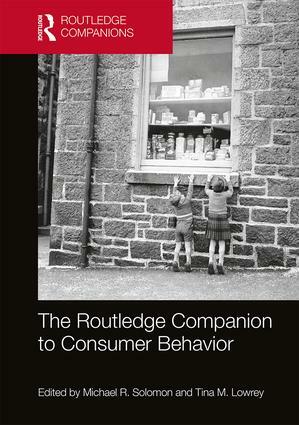 "In this new edited volume on consumer behavior, Solomon and Lowrey bring together a broad range of contributions that address many relevant topics in contemporary consumer research. The book not only reports on a broad range of topics, but also provides insights from many of the different scientific disciplines involved in consumer studies, making it a showcase of the multidisciplinary nature of the field." "Bringing together world-class researchers from diversified fields, this book provides a grand tour of the fast-changing area of consumer behavior. It’s up-to-date, easy-to-read, and comprehensive. A must-have for all researchers, graduate students, and practitioners who want to keep up with the research development in this area!" "This volume is an excellent companion to the study of consumer behavior. It covers the basic components, such as perception, motivation, attitudes, and learning. More importantly, it provides cutting-edge updates and new topics including effects of climate, the quantified self, retail therapy, and poverty. It clearly deepens and broadens our understanding of consumers." Community Lost: The Unrealized Collaborative Market Potential of Credit Unions Hope Jensen Schau and Albert M. Muñiz, Jr.
Michael R. Solomon is Professor of Marketing at Saint Joseph’s University, USA. Tina M. Lowrey is Professor of Marketing at HEC Paris, France.